This is an easy low calorie and delicious dessert. It is elegant enough for a dinner party as well as for the kids. In a bowl, stir together pumpkin, cinnamon, nutmeg, vanilla, milk, and sugar. 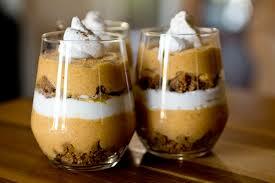 Layer the pumpkin mixture and yogurt and ginger cookie mixture into parfait glasses. Top with a dab of yogurt or whipped cream and sprinkle with cinnamon.